On 23rd May, WWE aired the 26th episode of 205 Live from the Huntingdon Center in Toledo, Ohio. The main event saw the culmination of the feud between The Brian Kendrick and Akira Tozawa as the pair went toe to toe in a street fight, whilst Austin Aries, Cruiserweight Champion Neville, Rich Swann and Ariya Daivari were also featured. But was it any good? Lets take a look. The show opened with a brilliant package with The Brian Kendrick explaining the history of his feud with Akira Tozawa, finishing by promising to teach the final lesson tonight. A decent opening match here, as Rich Swann got his opportunity to shine against Ariya Daivari, before getting jumped by Noam Dar during his celebration. The bout was your stand layout as Swann got a face shine with funky dropkick, before Daivari took control after sending Swann into the apron-tron with a hammerlock applied and Swann overcome hitting a Front flip Fameasser and spin kick for a near fall, followed up with a Phoenix Splash for the victory. The former Dragon Gate star sold his arm particularly well after going into the screen, including all the way through the celebration and it makes sense that Daivari would target it because of using the Cobra Clutch and Hammerlock Lariat as finishers in the past. I would've liked to have seen more creative offence from Daivari when targetting the arm, as a couple of unconvincing wear downs lost the crowd a little. The initial attack was brilliant, but without a vicious follow up it's impact drifted. The Dar attack continues the pairs feud around Alicia Fox with Swann taking a nasty bump off the top rope to floor after a push from the Scottish Supernova. ICYMI - A video package looking at the history between WWE Cruiserweight Champion Neville and Austin Aries ahead of their Submission match at Extreme Rules on 4th June. Neville has been a revelation since switching heel and becoming the face of the Cruiserweight division and it what started as a split-screen interview conducted by Corey Graves, he excelled in his Geordie condescender role. The King of the Cruiserweights was all over this segment as he pulled some of the most glorious facial expressions, showing disagreement with Austin Aries as the Greatest Man That Ever Lived claimed he deserved his title shot and explained Neville's underhanded tactics in previous bouts. Aries held his own, eating his trademark banana and talking up how his past and submission acumen would help him overcome The Man That Gravity Forgot, but lacked a killer line or barb that would've lifted his promo. These two have done some good work building towards Extreme Rules with two strong PPV matches, lets hope they finally nail it in their submission match. Cedric Alexander made his return, having been out since February, with a squash match victory over Johnny Boone (not the former WCW enhancement talent). Everything was going swimmingly until Boone sold Alexander's finish, The Lumbar Check, in the weirdest way. Boy, I loved this match. 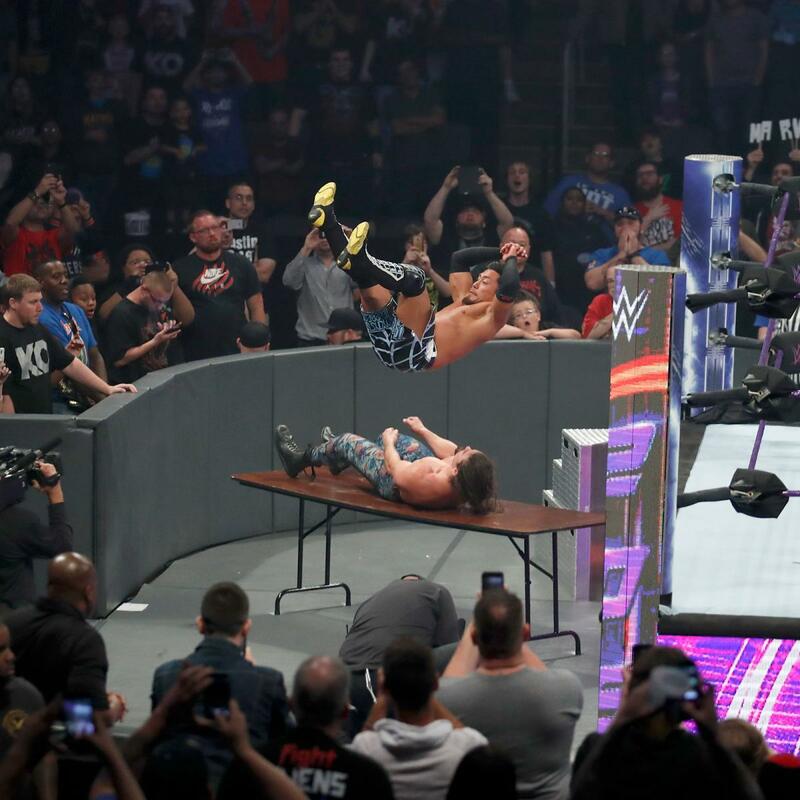 The feud between The Brian Kendrick and Akira Tozawa has been running for most of the year and has provided some of the most entertaining content of anything from Cruiserweight division with Kendrick attempting to teach Tozawa lessons after The Stamina Monster initially refused to be mentored by the Man with a Plan. This bout took all that months of build, the different lessons that had been taught by both men to each other and wove them into terrifically physical Street Fight. Corey Graves did some of his best work on commentary, making sure that when there was a call-back to the lessons, like Kendrick throwing his jacket to halt a suicide dive because "anything can be used as weapon" or Tozawa attacking Kendrick with his own belt because "you should never leave anything on the ground", w that the audience was fully aware. The two used the gimmick creatively with Kendrick bringing the purple wristtape he's used to tie the Dragon Gate star to the ropes, only to wrap around his opponents mouth and apply the Captain's Hook and then later tying him up around the ring post outside the ring to lay into him with a belt. The intense physicality was sold superbly by both men, who made it look every inch of the war that it was. By the time the two were battling around ringside, hitting Gordbusters of the steel steps, snap saito suplexes onto the floor and driving heads into the steps, Tozawa looked out on his feet and Kendrick could barely move. The Japanese sold the match all over his body and face, grabbing at his back after it had been whipped and had this beautiful dazed look on his mush. The finish was an utterly ridiculous Diving Senton to the outside through a table, in which Tozawa almost went into orbit before smashing Kendrick to bits in the ultimate final lesson. Yeah, the crowd wasn't as hot as it crowd wasn't as hot as it could have been and Tozawa rolling Kendrick into the ring was a weird end to a street fight, but seeing the pair lying in the ring post-match after Akira had draped himself across the Wizard of Odd for the cover made up for all of that. This match deserved to be seen by a bigger audience and you should watch it if you haven't already. No conclusion needed, Kendrick v Tozawa was lovely, watch it.